Note: The following essay is based on a segment from Skepticality. 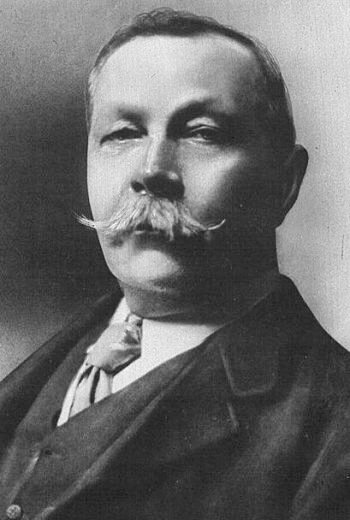 Sir Arthur Conan Doyle is known for many things: the creation of Sherlock Holmes, a spectacular mustache, and his belief in spirits and fairies. 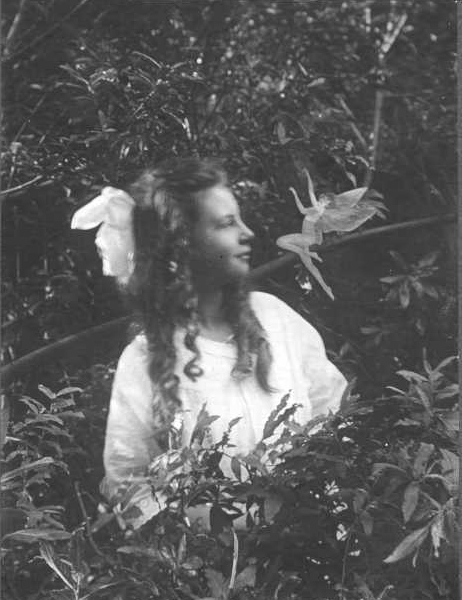 M’colleague, Bob Blaskiewicz, has discussed Doyle’s* seemingly ludicrous belief in the Cottingley fairies, but spiritualism was Doyle’s burning passion. He possessed a religious, missionary, perhaps even messianic zeal to promote belief in discarnate spirits and life after death. He lectured and wrote voluminously on the subject, including a two volume History of Spiritualism. How can an apparent fraud not be a fraud? Oh, so easily. For instance, he defends medium Eusapia Palladino although everyone–including Doyle and Palladino–admits that she sometimes did cheat. He, like Palladino, blames her trickery on skeptics who were looking for trickery. In other cases, the fraud wasn’t really fraud. On more than one occasion, an investigator grasped the foot Palladino was using to produce effects. Doyle doesn’t deny that a foot was grasped or that it was attached to Palladino’s body; however, he suggests it may have been a pseudopod, an ectoplasmic limb extruded from her body. This explanation assumes that skeptics are incapable of counting up to three. Doyle even believed that magicians, like his erstwhile friend Harry Houdini, possessed real supernatural abilities but refused to admit it. Doyle genuinely believed that when Houdini appeared to walk through a wall that he was actually dematerializing and walking through a wall (Brandon 168). While dismissing many scientists and sciences, he praises to the high heavens those scientists who shared his credulity and biases, such as Alfred Russel Wallace, the co-discoverer of evolution by natural selection. He is inordinately fond of the argument from authority, frequently citing the testimony of eminent men. He can be both snobbish and anti-intellectual. He even quibbles with other spiritualists and many mediums who don’t understand the true significance of spiritualism–that is to say, they do not interpret it the way he does. Worst, he can be uncharitable. Inevitably, he spends a considerable amount of time discussing Katie and Maggie Fox, who sparked the craze for spiritualism when they heard (or produced) knocks and raps in 1848. They were eleven and fifteen years old at the time. They were relentlessly exploited by their much older sister Leah. Leah ended up wealthy and secure and lived to a ripe old age. Kate and Maggie both descended into poverty and alcoholism, and Leah abandoned them when they became scandalous. Despite all his flaws, though, I find myself getting angry on Doyle’s behalf. He became a fervent, evangelizing proponent of spiritualism in the wake of World War I. His eldest son was seriously wounded in the war. After he had largely recovered, he died of Spanish flu. Doyle’s brother and two brothers-in-law died during the war and two nephews shortly after. Doyle’s devotion to spiritualism sprang from deep grief. He needed to know that his loved ones were all right, that they still existed in some form, that he would see them again, that he could still communicate with them. People who claimed they could communicate with his loved ones took advantage of his grief and betrayed his trust, just as psychics continue to take advantage of grieving people today. A wise man has asked “What’s the Harm?” Doyle provides an answer. Ruth Brandon, The Spiritualists: The Passion for the Occult in the Nineteenth and Twentieth Centuries, New York: Knopf, 1983. Hi again, everybody! Next entry on Folk-Linguistics follows. When a known language is identified by non-mainstream thinkers as the Ursprache /‘Proto-World’, the ultimate ancestor language of humanity (see my earlier posts), it is often a classical language highly regarded in the writer’s community for religious or similar reasons. A favourite is Sanskrit, the great classical language of Northern India and, as the vehicle of the Vedas and other such texts, the main classical language of Hinduism worldwide. When Sanskrit first came to the serious attention of Western linguists and its deep-time ‘genetic’ relationship with Greek, Latin etc. became clear, the notion of the Indo-European language ‘family’ began to develop (a key date is 1786). It was initially imagined that Sanskrit, ‘older’ than Greek or Latin and displaying archaic features and high levels of phonological and morphological systematicity, was especially close to Proto-Indo-European. This idea was soon superseded as Indo-European studies developed further during the 19th Century; Sanskrit is now regarded by linguists as an elaborated literary form of the North Indian branch of early Indo-European (see below), which also included the ancestor of later ‘Indic’ languages such as modern Hindi. But the initial view remains popular with non-mainstream thinkers, especially but not only those with North Indian or (most of all) Hindu connections. The more moderate such thinkers see Sanskrit as close to or identical with Proto-Indo-European, the more extreme see it as a world Ursprache. Indeed, this has become almost a popular ‘myth’. Many non-linguists who would never seek to publish non-mainstream ideas have come to hold folk-linguistic views about Sanskrit similar to those outlined above. Most such people (unaware of Indo-European or of language ‘families’ generally) seem to regard Sanskrit as a general Ursprache. Although some 200 years out of date even in its moderate form as applying only to Indo-European, this idea is very widely shared among disparate groups of thinkers: for example, David Oates, the originator of ‘Reverse Speech’ (see my earlier posts), apparently believes that Sanskrit is [regarded as] the Ursprache, and so did two members of my local philosophy discussion group until I told them otherwise. Another common error involves the idea that the -skrit in the word Sanskrit is connected with the Latin-derived English word script. Some people actually spell the word as Sanscript (I saw this recently on a panel in a Glasgow church where the words meaning ‘peace’ were set out in several identified languages). When questioned, some report that they have assumed or imagined that the name meant ‘sacred script’ (because of Sanskrit’s links with Hinduism). Sanskrit is, of course, a language and not a script (this crucial contrast is obscure to many non-linguists, and disastrous mis-conceptualisation ensues). The name of the abjadic-alphabetic script usually used to write Sanskrit and other North Indian languages is Devanagari or Nagari. And the word Sanskrit itself originally means ‘elaborate’, as opposed to the term Prakrit (‘simple’) which is used of the spoken North Indian Indo-European languages from which classical Sanskrit was developed. You are currently browsing the Skeptical Humanities blog archives for August, 2014.